In a host of applications in construction, landscaping, forestry, agriculture, disaster relief and many other areas, there are no other machines that offer the combination of versatility and productivity that can be provided by compact track loaders. This is due to their unique characteristics as tool carriers and the wide array of attachments that they can work with, from trenchers, augers, graders, soil conditioners, scarifiers and dozer blades to more specialist attachments such as forestry cutters and stump grinders. As tool carriers, compact track loaders offer many advantages over the comparable wheeled machines. They can provide increased productivity in many conditions with a lifting capacity approximately 25 per cent more than the equivalently sized wheeled loaders. While wheeled machines may outperform tracked machines for sheer manoeuvrability on hard surfaces, the rubber tracked undercarriage on track loaders ensures improved traction on rough terrain; soft, sandy surfaces and in wet, muddy conditions. Unlike traditional crawler or tracked loaders with steel tracks, compact track loaders offer exceptional manoeuvrability and fast cycle times. They are, therefore, ideal for use in clean-up work after severe storms, particularly in areas where the use of larger machines is restricted. Indeed, these machines perform so well in tough environments that they can significantly extend the season for construction, earthmoving and landscaping work well into the winter when the worse conditions are most commonly encountered. As well as being perfectly suited for working anywhere on uneven terrain, compact track loaders can also work well on snow in the winter, due to their superior traction and flotation. Combined with the low centre of gravity of these machines, the traction delivered by the tracked undercarriage also offers advantages for climbing and working on steep slopes in diverse applications from work on ski stations and other winter sports areas during the off-season to scrub clearance on motorway verges. The increased ground contact area and the lower centre of gravity means compact track loaders are generally more stable than wheeled machines, especially when shuttling backwards and forwards. The much better traction of compact track loaders provides 15 per cent more pushing force than equivalently sized wheeled machines, allowing them to push heavier loads without getting stuck. Moreover, since compact tracked loaders are equipped with dedicated rubber tracks, they will not mark paved surfaces and are therefore ideal for travel over and use on public roads. In fact, the excellent traction and flotation is ideal when working with planer attachments, where the machine hugs the surface for excellent stability and provides superior pushing power and precision for cutting into asphalt and concrete. Compact track loaders are also ideally suited for use in the rapidly expanding market for 2D and 3D laser grading systems. Overall, the smoother ride over rough surfaces enhances operator comfort and helps keep loose materials in the bucket. The lighter ride over all terrains also helps to eliminate downtime from damaged tyres. Approximately three times less than wheeled machines, the low ground disturbance of compact track loaders allows them to work on delicate surfaces, such as established lawns or asphalt, minimising damage and reducing the need for tidying up after the job is complete. By distributing weight over a larger area, the compact track loaders also offer a smooth ride with the high stability and manoeuvrability needed for grading and backfilling on rough terrain. The widest range of compact track loaders is available from Bobcat, with six models, namely the T110, T450, T590, T650, T770 and T870, offering rated operating capacities of 505, 665, 971, 1242, 1611 and 1726 kg and tipping loads of 1443, 1900, 2774, 3550, 4602 and 4931 kg, respectively. 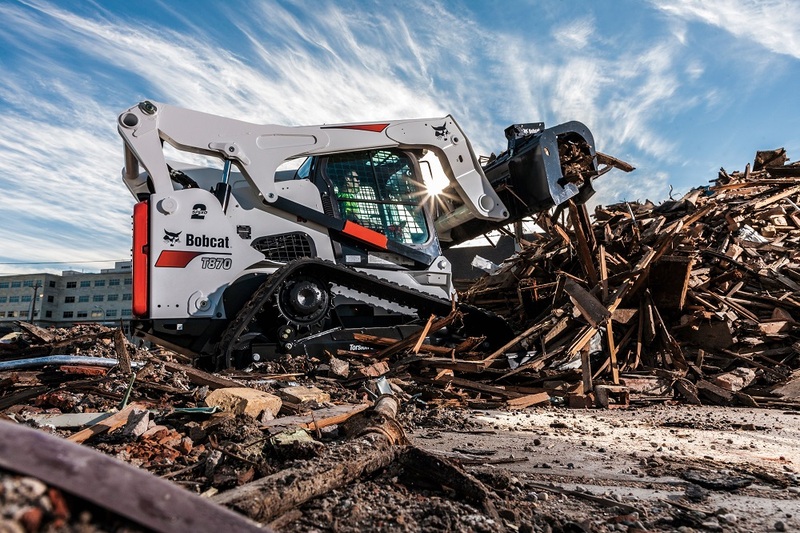 In the Bobcat range, there is a choice of size and boom configurations – radial and vertical lift path models – similar to those in the company’s market-leading wheeled skid-steer range. There are various options for rubber tracks with multiple tread patterns available, so that the performance of track loaders can be optimised by selecting a track that exactly matches the application. Wide tracks are a good choice when lower ground pressure and flotation are desired. For increased ground pressure, added traction and pushing force, it may be better to choose a narrower track. This manufacturer’s compact track loaders provide a very stable platform for working with a wide range of attachments. Using the exclusive, quick change Bob-Tach mountingsystems on the compact track loaders, attachments can be added or removed from the machines very quickly, ensuring the attachment fits securely and safely to the machine in seconds. Ideal for users needing to change attachments regularly, the Power Bob-Tach is a time-saving, electro-hydraulic device that makes the connection to the attachment automatically. 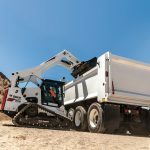 In the latest development in the range, the company has launched a new version of the top-of-the-range T870 compact track loader featuring a new torsion suspension undercarriage, replacing the previous T870 model with a roller suspension system. The T870 loader is intended to run the most powerful attachments from Bobcat such as wheelsaws to cut trenches for cable/pipe laying (including the WS32 wheelsaw providing an 80 cm dig depth) and the highly productive forestry cutter attachment. As well as work with these powerful attachments, the T870 is the highest-lifting loader on the market, providing increased productivity with every lift cycle for new solutions in demanding applications such as shiptrimming, grading, lifting, planing, landscaping, trenching, rental and construction. Introducing a completely new undercarriage design to its compact track loaders, the torsion suspension undercarriage on the T870 features torsion axles that dampen vibration, combining the comfort of roller suspension and the stability of a solid mount undercarriage with other new features to provide a track loader that outperforms all other machines on the market. The new T870 torsion suspension machine offers 10 per cent more lift capacity than the previous roller suspension model. The new T870 model is available with a wide range of standard and optional features and in a range of configurations to match emissions and specification requirements for all European, Middle East, Africa and Russia and CIS markets. The unit also provides a more comfortable and relaxed environment in the cab − achieving a new level of comfort without sacrificing work performance. The torsion suspension improves not only ride quality, it also absorbs stresses and vibrations encountered on the job. The result is reduced wear and tear, and improved component life, throughout the machine. The 5-link torsion suspension undercarriage minimises rocking when lifting a load high or when performing grading tasks. 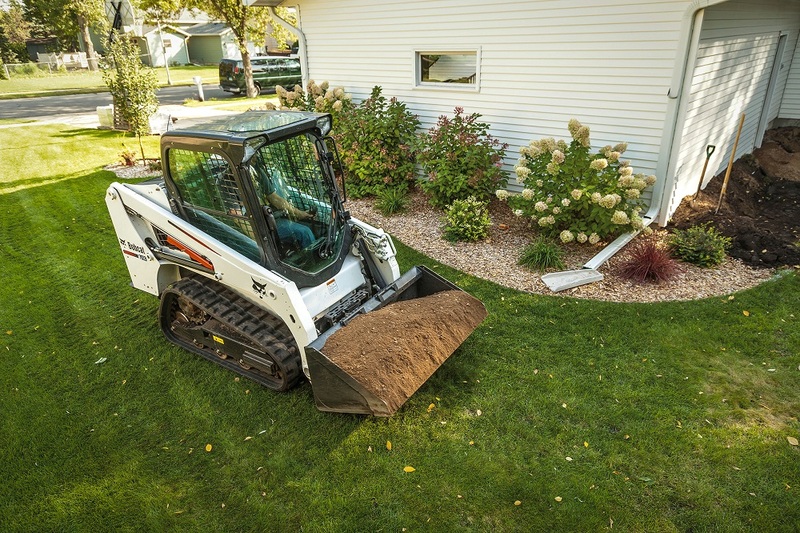 With the Bobcat undercarriage, there is no trade-off between comfort and performance. An additional link on the rear axle stabilises the system to decrease rocking or bouncing and increase productivity. The unique fifth link acts like an independent suspension, increasing ride comfort and greatly reducing the rocking effect that is typically associated with torsion suspensions. Equipped in this way, the machine feels even more stable and grounded, which improves ride quality and delivers unmatched performance when lifting and grading. The larger rear idler is positioned further back within the undercarriage system, allowing for greatly increased downward force to the cutting edge of the bucket or attachment. The added diameter of the new rear idler provides optimal contact with the track, which maintains tension and protects against de-tracking. The larger rear idler rolls easily over objects when backing up or travelling in reverse − which is ideal for forestry job sites or working in areas with lots of debris. These rollers are also wider to maximise contact with the tracks, minimise wear and deliver a smoother ride. For more information about Bobcat click here.